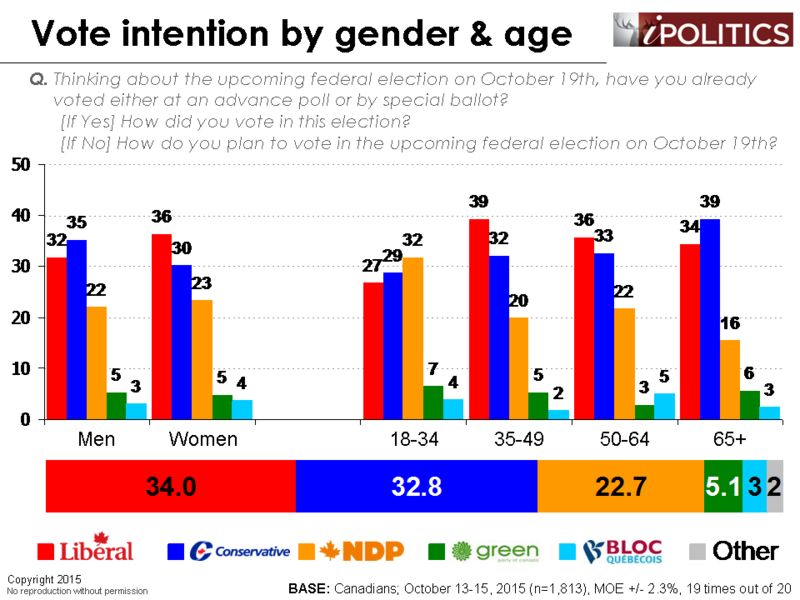 [Ottawa – October 16, 2015] As we enter the final weekend before Election Day, vote intentions appear to be settling in. 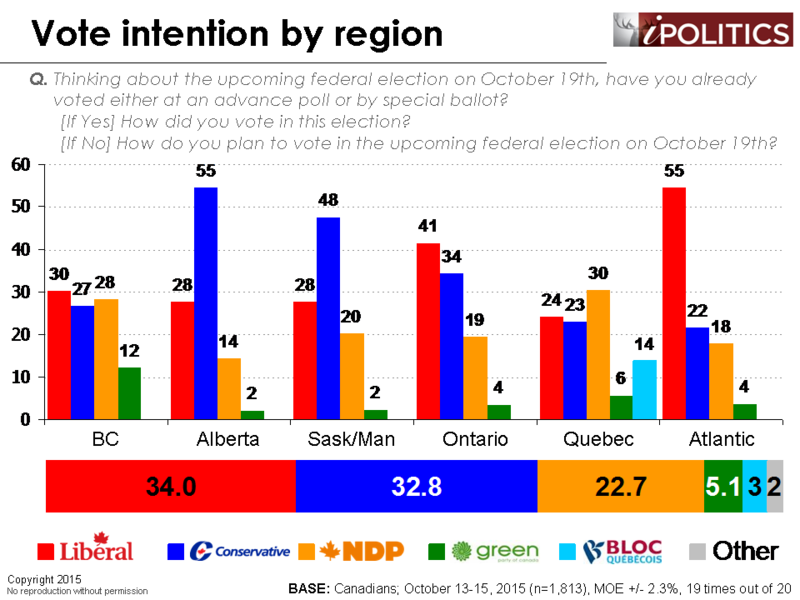 At 34 points, the Liberals hold a marginal lead over the Conservatives who are at 33 points. At 23 points, the NDP are well back in terms of popular support, but the rather efficient distribution of their support means they will likely still be looking at a fairly impressive seat count on Monday. The Liberals continue to lead in the key battleground of Ontario, although there is some evidence that the race may be narrowing here. Although the NDP maintains its lead in Quebec, the race remains unclear with both the Liberals and the Conservatives vying to make gains. The Liberals hold a clear lead in Atlantic Canada, while the Conservatives lead across the Prairies. British Columbia is still very much anyone’s game. The Liberals may be peeling back the senior vote from the Conservatives, as the Conservative advantage here has narrowed significantly over the last week. The biggest divide, however, remains education. 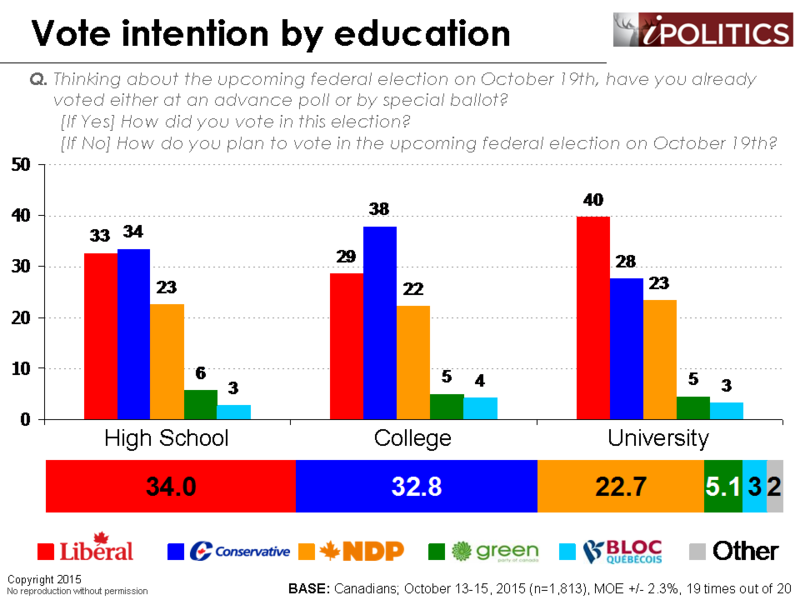 The Liberals maintain a clear lead with university graduates, while the college educated have rallied around the Conservatives. To account for those who have already voted, either at an advance poll or by special ballot, we ask Canadians whether they have already voted in this election. Overall, the two groups – those who have already voted and those who have not – mirror each other fairly closely in terms of party preference. Nevertheless, the Conservatives hold a slight advantage among early voters; indeed, if the election was called off and the victor determined by ballots already cast, the Conservatives would likely eke out a slim minority. Surprisingly, the Green Party fares quite well among early voters, which is highly notable for a party that routinely struggles to get its supporters to turn out on Election Day. Finally, while we know that the percentage of early voters in our survey is exaggerated due to social desirability and other factors, we note that cellphone users are showing up in comparable numbers to their landline-using counterparts. Of those who do not have access to a landline, 23 per cent tell us they have already voted, compared to 26 per cent on average. This is a rather significant finding, as cellphone-only households have historically been less likely to vote and we would speculate that this does not bode well for Stephen Harper’s prospects. This study involved a blended sample collected using two separate methodologies: Computer Assisted Live Interviews (CATI) and EKOS’ proprietary High Definition Interactive Voice Response (HD-IVR™) technology, which allows respondents to enter their preferences by punching the keypad on their phone, rather than telling them to an operator. In an effort to reduce the coverage bias of landline only RDD, we created a dual landline/cell phone RDD sampling frame for this research. As a result, we are able to reach those with a landline and cell phone, as well as cell phone only households and landline only households. The figures in this report are based on a three-day rolling sample. Each day, a new day’s worth of interviewing is added and the oldest day is dropped. The field dates for this survey are October 13-15, 2015. In total, a random sample of 1,813 Canadian adults aged 18 and over responded to the survey (1,331 by HD-IVR, 482 by live interviewer). The margin of error associated with the total sample is +/- 2.3 percentage points, 19 times out of 20. Cellphones are ubiquitous now. And btw your already voted numbers don’t support your hypothesis that cell phone users would be less likely to vote Conservative. 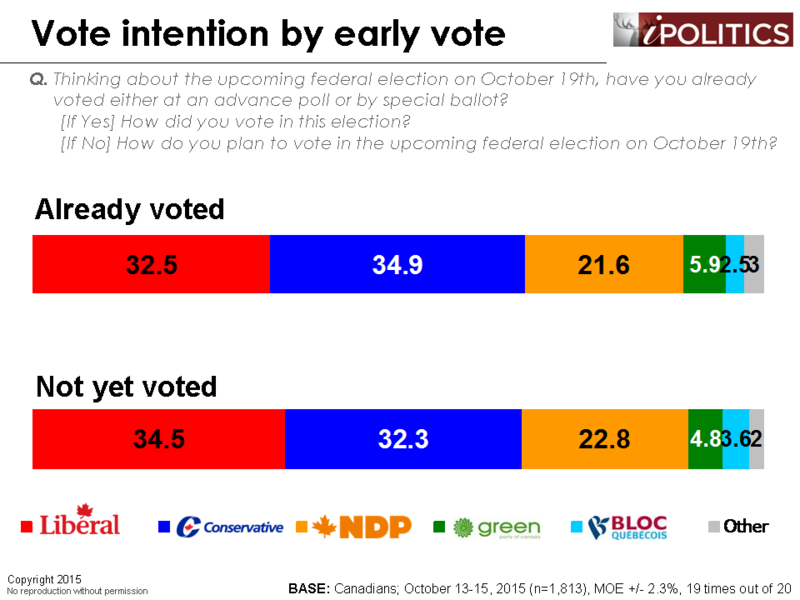 It is interesting that the early voting numbers appear significantly more in favour of the conservatives than the polling done by EKOS over thanksgiving weekend. Shouldn’t they match more closely? THere it is again … EKOS weeding out lots of Green support (no pun intended). 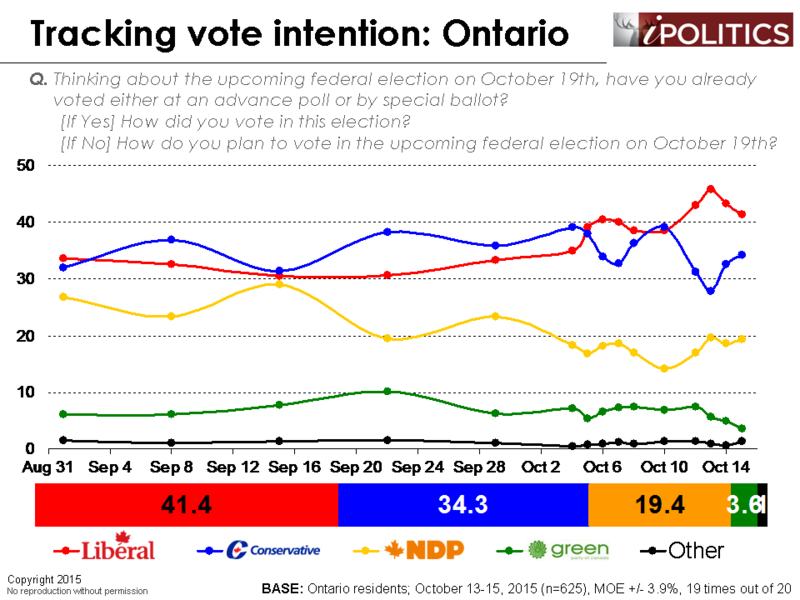 Why is the Green support so high in EKOS polls? Settle down everyone let’s post our comments on Tuesday morning. i would have actually expected advance voters to support the conservatives in much higher numbers, because they have the highest number of decided & dedicated voters. the average conservative voter made up their mind months or years before the writ dropped. the election isn’t a period of contemplation, for the bulk of them. i would have expected something more like 45%. 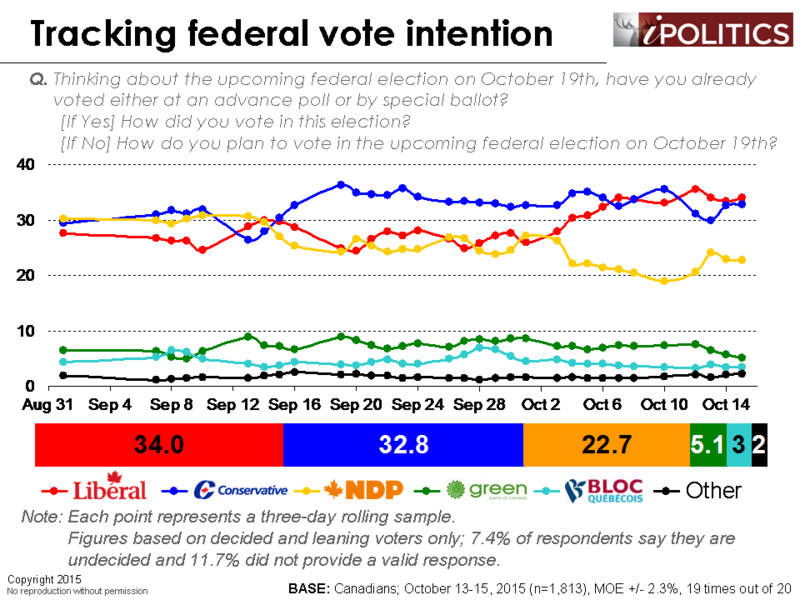 so, those are actually relatively good numbers for the liberals in the advance polls. in a sense, polling the advance voters does the same thing that removing very high numbers of undecideds does. when you reduce the sample space to dedicated decideds, the conservatives invariably get the highest numbers. to put it another way: if the liberals were clearly ahead in the advance polls (remember that there’s margins here…it’s a statistical tie), even by a point beyond the margin, you’d expect them to be on their way to a a huge majority. that would demonstrate endemic apathy in the conservative base, which you expect to dominate advance polls because they’re not deliberating anything. these numbers, as they are, suggest some pretty low levels of enthusiasm for the conservatives in their base. you may see the situation reversed (as it was in the 2014 ontario election); it may be the conservatives that end up with some turnout problems. i mean, that’s just unusually low for a party that continually polls 75+ in terms of dedicated voter support. what are they waiting vote? why *didn’t* they vote in greater numbers in advance polls? The reason that the Conservative voters haven’t already voted is that they were busy working. Somebody’s got to pay the taxes. Considering the only age group where the Conservative party leads is 65+ this might be a stretch. And don’t forget, advanced polling was over a long weekend. Generally people who work over a long weekend are part-time, students or shift workers in the retail, hospitality and health services. Not your typically supporter of the Harper government. Alberta? Is that you again? I’ve read elsewhere that the advance poll totals are the highest they’ve ever been. A 75% increase. This could signal strong support for conservatives. What polls can’t measure is situational effects on elections like a concert, strike, sporting event etc. In the case of this election the 3rd game of Jays divisional title is on election night. Many will rush to they’re favourite cave and likely not vote. The consensus was that the game would have a major impact & would decide a number of ridings and most likely benefit the Tories. Either way we will likely be at this again within 18 months as a minority seems most likely. Advance voting is an option. You must make your vote by the closing of the polls on election day. Your intention does not change if you don’t advance vote. MOnday night will be the longest night in Canada history. There will be blood for sure. Conservative still resilient and support their party strongly. Tories to win. Ontario Liberal support slipping. BC will decide this election and the NDP is splitting the leftie vote. The election of 2015 has been powered by a well-founded desire for change. But it has also been an election where the opposition has recognized the electorate’s desire for stability and continuity on all things economic. That’s why the Liberals and the New Democrats, while running on the rhetoric of change, put forward economic platforms built largely on acceptance of the Conservative status quo. How is pledging to run deficits and put it into infrastructure maintaining the status quo? How is repealing income splitting maintaining the status quo? Your comments have no factual merit. As I understand it pensioner income splitting will not be repealed. Splitting for others was introduced just a few months ago, hardly time to become the status quo. Seems to me that the Liberal promise to continue the PC practice of carrying deficits is maintaining the status quo. Although they have promised to spend it on job creating infrastructure projects rather than using the money to buy favour with special interest groups. It’s still a throw the bums out election and the swing to the Liberals from the NDP will continue (not that I like that!) and strategic voting will see the Liberals get more seats than expected. There could be a last minute gelling of the Francophone vote in Quebec, the Anglophones are going Liberal and if the Francophones do too then it could be a Liberal majority. What I have yet to see anyone mention is what is it that actually makes Turdeau PM material, other than the fact that they dont like Harper. Says a lot really, does it not? Wrong question. Were we electing a dictator it might be valid. But in a parliamentary democracy, the team is what must be evaluated, not just the team leader. Justin Trudeau and the Liberals have promised a return to true Canadian parliamentary style democracy. Abandoning the divisive, hate promoting and undemocratic practices of the current party in power. Seems to me he’s better PM material than someone who consistently misspells his name in a disrespectful and immature manner. It’s anybody’s game. the Conservatives have held steady throughout the campaign. If they get out on Election Day the Conservatives could still pull through with a slim minority. It is obvious the general public wants change. I just don’t see why they want it because the change is not much better. Fiscal Management vs high debt, borrowing and spending. Lobbying Scandal already before the vote is over! The Conservatives are seeing the Liberals tactics all over again and may just get out and vote. Just a quick question. The Nanos Poll shows a stark difference 37 Libs 31 Cons 23 NDP. Why is there such a different Picture?? Which is more accurate??? 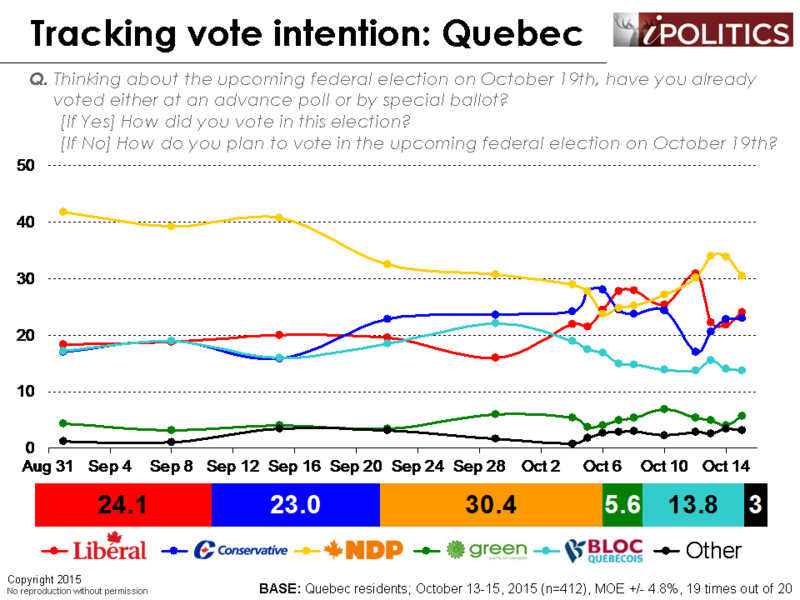 Both the Leger and Mainstreet polls, out today, are in line with the Nanos numbers. Ekos is now the only pollster with these close numbers. Angus reid advanced voters CPC 34, Libs 34. Ekos and Angus are almost identical. Ekos has a pretty shady track record with accuracy (look up their historical federal election accuracies). All 6 of the other pollsters, all of which have better historical accuracy, have a consistent minimum spread of 4,and 5 have a spread of 5 to 8. Based on that I have to discount EKOS a lot. Where is the breakdown of people who have already voted? Is this based on Friday’s sample size only? I notice the question wasn’t included in previous days full reports. I would like to know what the sample size of the people who have already voted was, the region breakdown and the weighting. Also, what is the MOE for this group only? 10% of 1800 people is a very small sample size. Even 30% of 1800 is still very small. Some extra details would be greatly appreciated. It’s a mystery to me how the conservative government remains in the running. I have never witnessed such slathering vitriolic outright hatred in my life. 99% of the news outlets slant unabashedly against Harper. The CBC is so worried that they might have to actually do some work to survive under a tory re-election that they continually attempt to steer the narrative.Also ctv, toronto star,huff post,La presse, ad nauseum. Naive old me always assumed the media would take a neutral position in something this important. Same in the U.S. when you are a conservative. Thank God Canadians are much smarter than the media thinks. 99%? Oh please! At least you could try for a tiny bit of objectivity. The outlets you site are probably read or listened to by less than 25% of the public. Conservative media includes Post media, Globe and Mail, the Sun, most AM talk shows. Both dailies here in Vancouver are heavily biased to the right. Really if you don’t like Liberal left media they are easy to avoid. But I can’t read a local daily here on the supposed left coast without throwing up. What moderation is required. I don’t see anything wrong in calling the some of the media biased against the Tories. The NANOS polls sponsored by the GLOBE & MAIL [who endorsed the CPC’s policies but not HARPER] and CTV…Those are hardly left wing institutions. MAIN STREET is sponsored by POST MEDIA who is already endorsed HARPER. If HARPER is behind in right leaning sponsored polls then he is in big trouble. 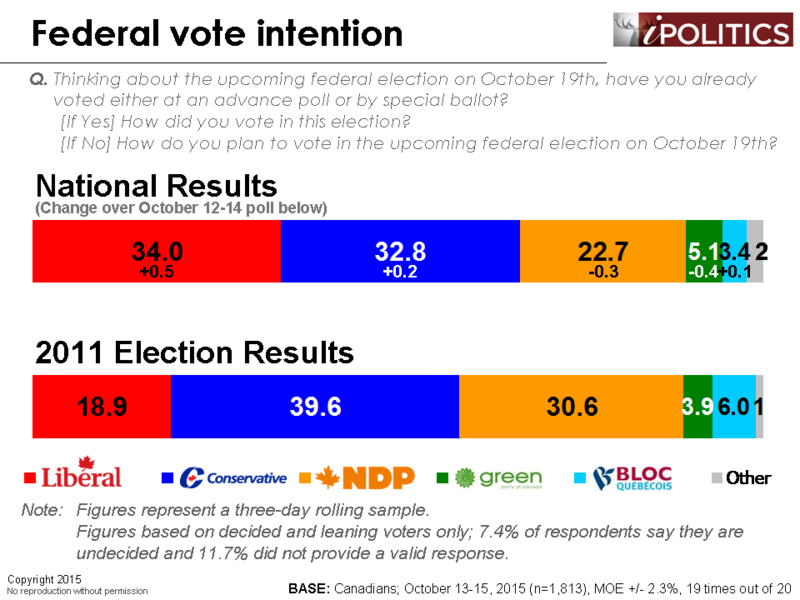 The CBC who does NOT sponsor any of the polls says that the LIBS has the lead at 35.6% taking all of the polls into account in their poll average. Still , in every single poll the LIBERALS hold the lead of some short. We will see on Monday. As EKOS says above it all depends on who you phone an who answers their phone. I am voting LIBERAL I haven’t been polled nor have I answered my phone. I have caller identification. Ekos is IVR. I don’t know about others, but I hang up immediately when I hear a bot. So I would likely respond to a Nanos poll and not to Ekos. This may or may not have a bearing on the accuracy of the pollsters, but it does indeed seem odd that Ekos has been so consistently out of step. They way underestimated conservative support in 2011. Are they overcompensating now? I don’t pretend to know. I do know that I wanted to vote early in my urban NDP-Liberal riding, but was put off by the long lines. I will vote tomorrow, and strategically. We’re the lines perhaps shorter in rural areas where the Cons can expect to do well? Are strategic voters waiting until the last minute? It’s all a guess, but a certain pollster is going to look either awfully good or awfully bad on Tuesday. I don’t see any reason to believe the Liberals will outperform advance polls by some 10%, given 3 million Canadians have already voted and we will only get to about 18 million votes in total, leaving only 15 million left. I would read the last paragraph of EKOS article. The “already voted” numbers are not valid. There is no way of knowing how people voted until the ballot boxes are opened. Justin Trudeau copies a lot of PM Harpers new benefits, whether the largest infrastructure projects in Canada’s history, while he hesitates regarding if he should support trading with over 800 million new customers and dozens new trading partners the Prime Minister worked so hard to acquire. He will tax people higher each year, and leave you the change in your pocket….real change, don’t you know. Don’t hold your breath on initiating promises. My kids tell me that their friends are voting Trudeau because he’s young and ‘understands’ them. When asked if they know what the Liberal ideologies are, as show by Wynne’s spending spree etc in Ontario, they answer ‘no’. They don’t even realize Ontario has RECORD unemployment for university grads (FYI – this trend started under McGuinty who also introduced the highest tax increase in Ontario history after signing a document saying no tax increases before he was elected). I’m wondering if our education system is failing to teach these kids to think for themselves?? In the UK in May, it was the majority of pollsters that got it wrong, for reasons they still don’t quite know. Beware of writing off the outlying company (i.e. Ekos). Shouting is not going to make the message any more accurate. Check your history. Last Liberal government left current Conservative government a healthy surplus. Guess what? The Conservatives managed to blow it in less than a year! Besides, the logic is simply wrong. Higher taxes do not necessarily “kill” an economy. Since you claim to be a student of history, take a look at historic tax rates and economic performance. ALSO TRUDEAU WANTS TO TAKE AWAY INCOME SPLITTING AND LOWER THE TAX FREE SAVING, WHICH IS THE BEST THING SINCE SLICED BREAD,THEREFORE, THE CONSERVATIVES ARE THE PARTY OF THE WORKING CLASS BECAUSE THEY HAVE LOWERED OUR TAXES AND BROUGHT IN THOSE FINANCIAL GIFTS FOR ALL OF US. THE WORLD IS IMPLODING BECAUSE OF HIGH DEBT, AND CAUSING BIG PROBLEMS AROUND THE WORLD, AND NOW WE WANT TO VOTE IN TRUDEAU TO PUT US BACK IN DEBT, AND WON’T BE A SMALL DEBT EITHER LIKE HE SAYS, BECAUSE HE DOESN,T KNOW ANYTHING ABOUT BUSINESS OR ECONOMICS.HE IS A RICH, SPOILED FRENCH CANADIAN THAT DOESN’T KNOW ANYTHING ABOUT THE REAL WORLD. PLUS IF YOU TALK ABOUT CORRUPTION THEN THE LIBS ARE IN A LEAGUE OF THEIR OWN. LIKE 2 BILLION DOLLARS TAKEN FROM TAXPAYERS AND NO ONE WENT TO JAIL FOR IT AND WE ARE PAYING FOR THEIR BIG FAT PENSIONS. SO THEY CAN’T TALK ABOUT CORRUPTION.